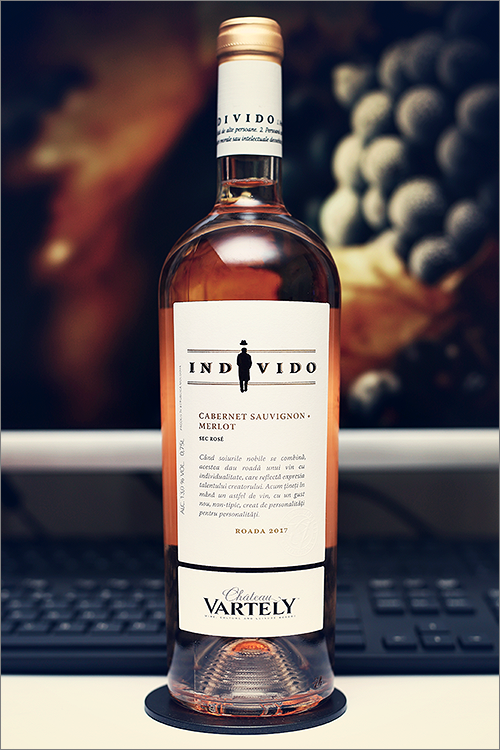 Tonight we are going to review another rosé wine blend, yet this one is made of cabernet sauvignon and merlot grape varieties – Individo Cabernet Sauvignon – Merlot 2017 from Château Vartely. This wine is part of the ‘Individo‘ wine series, that is a set of 6 wines, each with its own personality and character. Rosé wine happens when the juice of red wine is strained from its skins before it becomes too dark, therefore the winemaker has to make sure that he removes the red grape skins (the source of the red pigment) when the wine reaches the perfect color. The biggest challenge of rosé wine is that more often than not it lacks acidity, which means that the wines can become flabby quite quickly, for this reason, it is better to drink them early on, as long as they are young and scented, but enough theory, let’s move on to the tasting and find out just how good this wine is. Pale peach-orange color, with bright amber shades towards the rim of the glass. The nose is strong, filled mostly with citrus flavours and sweet berry fruits: orange zest, mandarine, ripe white cherry, mirabelle, peach, cranberry, strawberry, wildberry, yellow apple, raspberry, quince, ripe apricot, nectarine and some nunced hints of baked apple. The wine is dry, with high alcohol level, high acidity and ripe tannin. This is a quite refreshing, crisp and zesty rosé wine, with a nuanced and fruity profile, as it tastes seedy, firm and appealing. It has a fair overall balance and it feels very elegant – a fine rosé wine indeed. The wine has a medium finish and a balanced, bitter-seedy and crisp aftertaste. This is definitely a great Wine of Moldova and the overall rating says the same, with 90.4 points scored it is right there, among the best wines we’ve tasted so far. Please click on the chart icon on the left in order to get to the wine rating page, where you can find all the wines we’ve tasted to date. Conclusion: this is definitely a wine in its prime form – rich, expressive and delicious, maybe just a bit too seedy, yet very appealing and elegant. It can also age another 9-12 months in the bottle, yet, our recommendation is to drink it now, as long as it is still young and beautiful. Just keep in mind that it is always better to drink a wine a year too soon than a day too late. In order to enhance the wine’s aromatics, try and pair it with strawberry panna cotta or a raspberry cheesecake dressed in white chocolate, as the high acidity in the wine will be perfectly countered by the smooth sweetness of the dish.